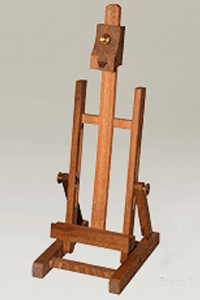 * Hand finished Elm wood easel for display of Photos, China, artwork or most any keepsake. * Oversize is 5.125" W x 6.325"D x 14.5" H.
* Upper Wooden block opens to 10" and locks in display article. * Display angle range up to 20-Degrees. 19" x 6" x 4"